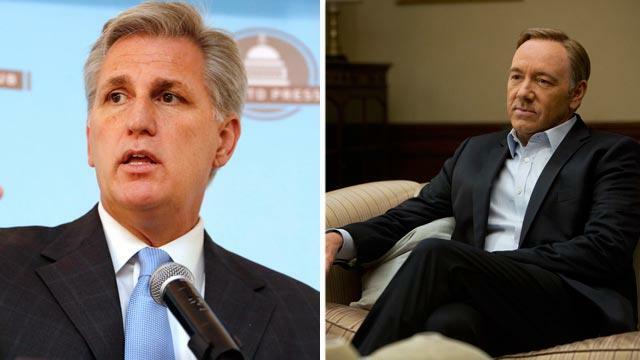 Is Rep. Kevin McCarthy the real Frank Underwood? The real-life House majority whip told CNN's Candy Crowley that he gave Kevin Spacey one of his signature lines in the Netflix hit show "House of Cards," the main character of which is Spacey's Frank Underwood, an ultramanipulative, Machiavellian House majority whip who plots to snag the vice presidency and ruins a few lives in the process. Confronted by two rank-and-file caucus members poised to vote against a bill he supports, Spacey tells them: "I'm gonna say to you what I say to every congressman that sits where you're sitting now: Vote your district, vote your conscience, don't surprise me. Now, the most important one of those is don't surprise me." Spacey delivers the line with a high degree of drawl-infused menace. And apparently he got it from McCarthy, the California lawmaker who coauthored the 2010 book, "Young Guns: A New Generation of Conservative Leaders," with House Majority Leader Eric Cantor and Budget Chairman Paul Ryan. The three are seen as a relatively young (McCarthy is 48), tea-party power crew driving conservative policy in the lower chamber. "I gave him that line," McCarthy said on CNN's "State of the Union" Sunday. "I didn't deliver it that way, but I gave him that line." Which raises the question: Is McCarthy plotting to replace Joe Biden?